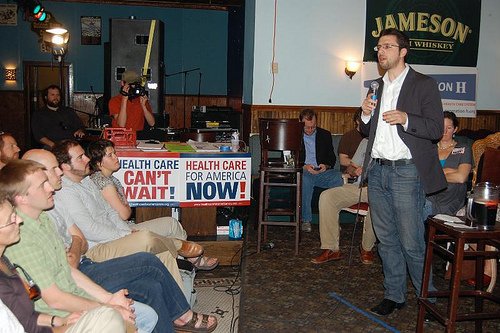 Ezra Klein speaks out for health care in Montana, 2009. News broke this week that Ezra Klein, a blogger-turned-traditional-media-columnist covering economics at The Washington Post, would be leaving to start his own media company. No details yet on who would be backing the venture after Jeff Bezos, owner of the Post, turned down Klein’s double-digit-million investment request. Details of Klein’s new project are unknown. However, he will be joining a crowded startup market that already includes Kara Swisher and Walt Mossberg’s Re/Code, the Neetzan Zimmerman-helmed social network Whisper, and First Look Media, Glenn Greenwald’s new site funded by Pierre Omidyar. The biggest lesson to be learned is this: you can’t hide from the social Web. A generation of sophisticated consumers is emerging, demanding respect. It will readily challenge information and knock back spin, wrote Lewis DVorkin at Forbes in 2012. So far there have been very mixed results from star journalists stepping out to build their own branded news empires. Arianna Huffington of The Huffington Post and Andrew Sullivan are two of the most successful, though Huffington’s background credentials were more political than journalistic. Election data blogger (and star) Nate Silver recently left The New York Times to do the same. On the opposite side of the spectrum is The Daily Beast, managed by Editor-in-Chief Tina Brown and backed by mogul Barry Diller. This venture has managed to lose $100 million (so far), according to Michael Wolff at The Guardian. [T]heir accomplishment is less a personal journalism vision than it is the more specialized skill of traffic aggregation. That’s the key attribute and asset of each of these sites, not the uniqueness of the journalism, but the back end deals, algorithms, and canny, proprietary, practices of drawing large amounts of traffic. Which brings us to brand journalism, a viable option for journalists with established reputations on specific beats. Journalists need not be household “stars” but do need niche-specific leadership and reporting credentials. Brands view these journalists as allies in a large part for the way their personal brands pull the spotlight to their businesses. From the journalists’ perspective this can be a welcome opportunity to further their personal brand across a new platform, often with greater exposure. Win-win. Right? Bloggers like Klein are one-in-a-million. Few of the “9%” are invited into the fold of traditional media, make a name for themselves, and successfully exit to build their own media empire. Yet, there are millions of bloggers creating mini-empires in crevices unknown to most but very important to a select audience. It’s the head of those mini-fiefdoms that are golden for brands choosing to invest in brand journalism.